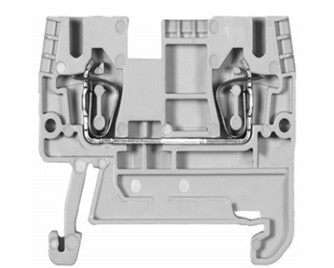 Terminal Blocks, Type AB11 0 Spring technology, type AB1RRN use spring technology, the most cost-effective connection technique on the market. Compared with screw clamp technology, this technique significantly reduces wiring time. It could also eliminate the need for regular retightening. The material used (polyamide 6.6) provides better resistance at high temperatures. The flammability rating of these products is V0 according to UL 94. Download the Terminal Blocks, Type AB11 0 Spring technology, type AB1RRN catalog below or call 714.835.6211 for more information.